Per Se, the restaurant, isn't where I go for lunch or dinner. It's ideal for a wedding, a Bar Mitzvah, a coronation, any sort of once-in-a-lifetime event. The meals are so long—nine courses plus canapés and petits fours—that seasons seem to change while you're seated in the main dining room, looking over Central Park. Service is too intimate and too loquacious—I feel the way I did as a kid when my Aunt Bella trapped me in a corner and started meddling in my personal life. I haven't mentioned the price, which is way up there, because what you eat at Per Se is worth whatever you have to pay. Thomas Keller's cuisine, French technique combined with American creativity, is extraordinary, gorgeous, and unlike anyone else's. A foie gras terrine with all manner of brilliant accents had more colors than a Kandinsky painting. For someone like me, who finds the dining room experience excessive, the salon is perfect. It's the first room you enter after passing through the tricky front door, and in the early days of Per Se, it was depressingly empty. Three years ago, someone came up with the clever idea of offering no-reservation, à la carte dinners there. In this case, "à la carte" is defined as eating a normal-sized meal at a price normal humans might consider reasonable, although it will approach $300 for two. I no longer think of the salon as bleak. Now it feels intimate and private, just me and a few other discerning folks seated on soft, velvety couches or cushioned chairs, eating with good flatware off extra-wide coffee tables. It's informal, which everyone seems to find desirable these days, and it's dignified, which I still desire these days. If you come early enough, you can grab the single couch that overlooks Central Park and watch Manhattan sink into darkness. Pair such ambience with Keller's legendary butter-poached lobster, and you'll be experiencing the best of New York. The chef Eli Kaimeh, far right, oversees the preparation of an eagerly awaited dish at Per Se, Thomas Keller’s restaurant in the Time Warner Center on Columbus Circle. 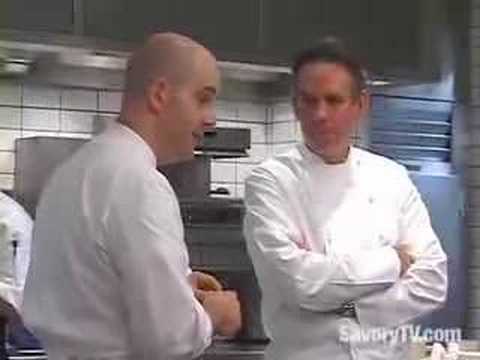 The restaurant opened in 2004, an East Coast satellite of Thomas Keller’s legendary French Laundry in Yountville, Calif. It was Mr. Keller’s first venture in New York since the late 1980s, when he walked away from Rakel, a yellow-tie expense-account establishment buffeted by the recession. Per Se astonished diners from almost the very first. In a review published in September 2004, Frank Bruni of The New York Times awarded the restaurant four stars, the newspaper’s highest rating. Mr. Bruni was not unreserved in his praise. Per Se in its early days could be a marvel of pretension and clock-gobbling silliness. I had a dinner there that first year that appeared to seamlessly combine French pretension with control-freaky West Coast pedantry. I learned a lot about the provenance of the caper berries, the butter, a single frond of micro carrot green. There were tight smiles and stifled yawns. “Maddening,” Mr. Bruni called such a night in his review. But in recent years, and particularly under the kitchen command of Eli Kaimeh, who has been Per Se’s chef since early 2010, Per Se has matured. Its synthesis of culinary art and exquisite service is now complete. It represents the ideal of an American high-culture luxury restaurant. Per Se’s signature starter course is Oysters and Pearls, a dish Mr. Keller developed at French Laundry and brought with him when he moved East. It combines a sabayon of pearl tapioca with Island Creek oysters (small, marble-shaped, from Duxbury, south of Boston, fantastic) and a fat clump of sturgeon caviar from Northern California. These arrive in a bowl of the finest porcelain from Limoges. Paired with a glass of golden sémillon from Elderton, they make a fine argument for the metaphor of transubstantiation. But perhaps foie gras is more to your liking? At one dinner at Per Se, I had a torchon of moulard duck foie gras from Élevages Périgord in Quebec, served with a crystallized apple chip, some celery-branch batons (taken to 11 on the flavor scale by some compression and sous-vide cooking), Granny Smith apple marmalade, candied walnuts, frisée and juniper-balsamic vinegar. I spread it thickly on brioche toast that a server kept replacing every few minutes, since (he said) it should never be eaten cool. (This is true, as it happens: the bread grows heavy and stiff.) I ate it silently, as one can do only with friends and family, savoring the experience as I might have a massage or a sunset. Such excitements have a real effect on who ought to go to Per Se and why. The restaurant is not a place to book for a business meal. Nor is it a restaurant for those who do not eat well together. A meal at Per Se can stretch to four to five hours — a long time to sit with anyone, even a client with whom you are trying to close a multimillion-dollar deal. The restaurant more handsomely rewards the companionship of those who love one another as much as they do pleasure and indulgence. Nor is Per Se a restaurant for those who do not understand that such pleasure comes at a cost. The menu has a set price of $295 a person, excluding wine. Nine or more courses are prepared, along with canapés to start and mignardises to finish. A conversation with a sommelier can easily double the cost of the buy-in. Dinner for two can scratch at $1,000 — or about the same as the median weekly household income in New York State. By point of context, though, an aisle orchestra seat at the Metropolitan Opera for Donizetti’s “L’Elisir d’Amore” runs $330, also excluding wine. And to some, a simple garden salad is the functional equivalent of an aria — particularly as sung at Per Se, with compressed figs and young red beets, Hakurei turnips (small, plump and white, very cute in aspect), red ribbon sorrel and a coulis of pine nuts. Each flavor is bright, distinct, amazing, but none is so purely intense, as reduced to its essence, as the dense, fragrant craziness of the figs. The restaurant’s truffle-stuffed fat-chicken thigh — crisp, soft, juicy, deep in flavor, with Medjool dates made into marbles, a Nantes carrot mousseline and buttery truffle sauce — might be a tenor’s great turn. And the beauty of Christofle flatware and Raynaud china, as well as a polished view of the Christopher Columbus statue below, the twinkle of gas firelight and the feel of linens ironed to the texture of freshly sanded pine, can be exactly analogous to towering sets and a thundering orchestra, to the kind of stagecraft that can lead to tears and applause. For such people, Per Se exists. A meal at the restaurant at the end of September brought pan-roasted Massachusetts cod, with applewood smoked bacon, briny littleneck clams, pickled garlic, celery and shoots of parsley. “Clam chowder” was the description on the menu, as “shiny glass” might have advertised a diamond. The cod had a sweetness beneath its crisp, salty exterior that was distinct from that of the clams, which claimed the texture of the bacon. It was a pure distillation of autumn east of the Bourne Bridge, a Hopper painting made edible, seafood squared. Another Keller Klassic followed: butter-poached lobster, with melted leeks and horseradish crème fraîche, thin-sliced potatoes roasted in clarified butter, watercress and a lemony red-beet emulsion. There was pressed duck on the table, too, blood-mineral against the funk of Burgundy truffles. Rabbit with cherry tomatoes and sweet corn, a wave of frisée and a beautiful swoosh of truffled hollandaise. Charred eggplant with compressed cucumbers, more red ribbon sorrel and fresh market peppers. Course after course arrived: tiny, rich little plates of food running into one another as if to create a montage sequence or a kaleidoscopic dream that ended in a castle of chocolates and macarons. You may ask to tour the kitchen afterward, or linger over coffee, or simply stare out at Columbus and his dour expression, and contemplate Nirvana. Per Se has competitors up on restaurant Olympus, Heras and Poseidons with dominions of their own. The towering Deco ceilings of Eleven Madison Park are a marvelous frame for the precise, artful cooking of Daniel Humm and the genial, mind-reading service style of the restaurant’s general manager, Will Guidara. You can eat in well-upholstered Continental luxury, with virtually your every need addressed and hunger sated, at Daniel or Del Posto. (And you ought to.) Jean Georges is among the best places in the world in which to celebrate a business deal. And I had a serving of shaved razor clams with sea urchin sauce and Osetra caviar in the beautifully renovated new dining room of Le Bernardin that was the most fully realized and delicious combination of flavors I have experienced in 2011. Maguy Le Coze and Eric Ripert, that restaurant’s owners, stand tall amid these ranks. Observation and reporting would seem to suggest that such coddling is the case for most who eat at Per Se, not just those who are regulars or who are, like me, dining professionally. With just 16 tables in a huge space in the center of Manhattan, no restaurant can afford to snub people paying such long money for meals. Time Warner Center, Columbus Circle; (212) 823-9335, perseny.com. ATMOSPHERE A handsome brown-hued dining room with 16 tables, a great deal of space between them and a gripping view of Columbus Circle and Central Park. SOUND LEVEL Quiet, though laughter rings out often and comfortably. RECOMMENDED DISHES Oysters and Pearls, gateau of foie gras, clam chowder, sweet corn velouté , omelet with mushroom duxelles and aged tamari, butter-poached lobster; pressed duck; huckleberry sorbet with whipped lemon verbena and red-wine granité. WINE LIST Lengthy, thoughtful and widely varied in geography and price, with many bottles under $100. Sommeliers provide excellent pairing advice. PRICE RANGE Two menus available, one a vegetable tasting, the other a chef’s tasting: nine courses, $295; an à la carte salon menu runs $14 to $46. Lunch tasting menu: five courses, $185. All prices include service and non-alcoholic beverages. HOURS Lunch Friday to Sunday, 11:30 a.m. to 1:30 p.m. Dinner daily, 5:30 to 10 p.m.
RESERVATIONS Call exactly one month ahead, at 10 a.m., when the reservation line opens. Expect to redial and to hold. This is Sam Sifton's last review. A new restaurant critic will be named later this year.